Is Living With Extreme Wildfires The New Normal? The Yarnell Hill fire in Arizona was deadly in part because of how close a highly flammable forest was to a community. The U.S. once faced a crisis with structural fires, but managed to change regulations to turn the trend around. Experts say it will take a renewed effort to take on this newer fire threat. Is Living With Extreme Wildfires The New Normal? A wildfire burns in Prescott, Ariz., on June 18. 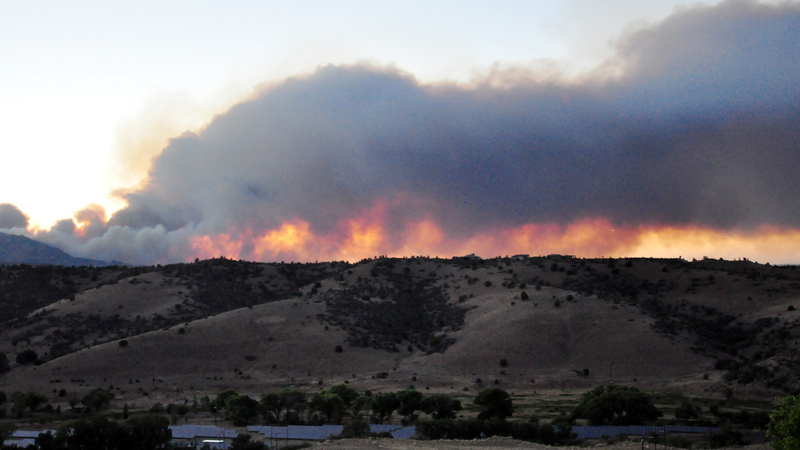 The fire covered nearly 11 square miles of the Prescott National Forest. It has been a deadly year for the people who fight wildfires. In total, 32 people have lost their lives fighting fires in 2013; the highest number in nearly 20 years, according to the National Interagency Fire Center. Just one incident accounts for most of those deaths, the Yarnell Hill fire in Arizona. In June, the blaze blasted through a firefighting crew known as the Granite Mountain Hotshots; 19 of the 20 men died. As people move farther into wildland areas and climate change turns landscapes into tinder, experts say the wildfire danger around the country will likely only grow. But there may be a lesson to learn from how the U.S. stifled an earlier fire crisis in urban settings. The Yarnell Hill fire started from a lightning strike that sparked a brush fire. A fire hadn't hit the area in more than 45 years, and it was "primed to burn," according to a report released Saturday. Powerful winds spread the flames across thousands of acres in a matter of hours, catching residents unaware. Residents had to leave their homes at a moment's notice. Deployed between the flames and people's property were the Hotshots. The crew members moved away from a safe, burned-out area and toward a ranch, another safe zone. But along the way, the winds shifted, and they became trapped by the fire. The crew leader radioed back that they were deploying fire shelters — a last resort. "That was the last time that I heard my superintendent's voice," says Brendan McDonough, the lookout who was separated from the group and the sole survivor. The 21-year-old recalled the tension of that day in an interview with Arizona's Prescott Daily Courier. Investigators have tried to piece together exactly what happened in the Yarnell Hill fire. The Arizona State Forestry Division's incident report, released on Saturday, said the fire was moving fast — more than 10 miles per hour. In the end, the Hotshots had just two minutes to prepare shelters. Investigators also say they cannot explain one central mystery: why the firefighters moved away from a safe area. In a news conference, lead investigator Jim Karels said, "That decision-making process went with those 19 men." Environmental journalist Michael Kodas tells NPR's Arun Rath that the Yarnell Hill fire was so deadly because of a number of converging factors that occur in Arizona. "We've been putting out fires in the western United States for more than a century, and this allowed our forests to grow unnaturally thick," Kodas says. "That's something that's really noticeable in Arizona." Kodas says the forests there, after years and years of fire suppression, often have 10 or 20 times more trees, scrub and grass than they did naturally. There is also an expanding wildland-urban interface, he says, a "term firefighters use to refer to the point where homes and communities abut really flammable forest." 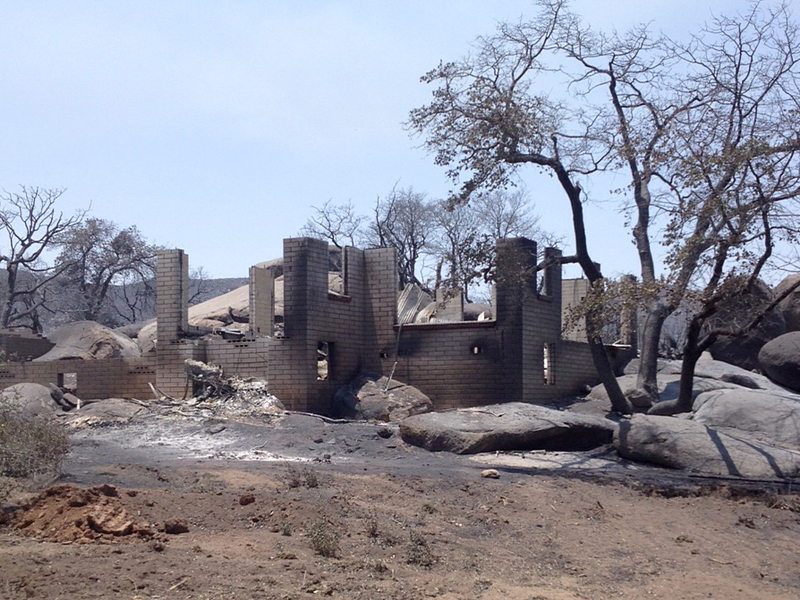 A house destroyed by a wildfire in Yarnell, Ariz. Experts say increasing expansion into wildfire-prone areas has created new challenges for firefighters unequipped to protect houses and structures. This expansion has changed the way wildland firefighters operate, and many are now expected to also protect homes and property in the woods. This is something Kodas says they aren't equipped to do, unlike their urban counterparts. "They're wearing very lightweight, flame-retardant clothing and just carrying the fire shelters," he says. "When a forest firefighter ends up trying to protect a house, they're really not prepared for the hazards that come with trying to protect a structure." Kodas, who is writing a book about the wildfire crisis, believes the only explanation for why the Hotshots left the safety zone was that they wanted to get to a place where they could "re-engage the fire and try to prevent it from burning into the town of Yarnell." In tackling the growing problem of wildfires, the nation's handling of its structural fires could serve as an example. In the early 1970s, the U.S. had reached a crisis point with structural fires. Blazes were killing more than 12,000 Americans every year. The federal government established a commission and released a report called America Burning. Alexander Maranghides, a fire protection engineer with the National Institute of Standards and Technology, says the America Burning report marked a major turning point in fire safety. "This was really the catalyst to really put together a research effort that resulted in significant improvements in the building codes and standards and test methods," Maranghides says, "which, over decades, has yielded a fantastic level of success." Now, the number of deaths from fires every year has decreased to around 3,000. But Maranghides says fires in the wildland-urban interface present a new and dangerous threat. "The wildland-urban interface problem, when compared to interior building fires, is technically, and I'm being conservative here, an order of magnitude more complex," he says. Maranghides says understanding wildfires will require the kind of focus that the America Burning report once provided. He says with wildland-urban interface fires, the U.S. is currently about where it was 30 years ago with building fires. So Maranghides and his colleagues have proposed a scale to assess potential wildfire risk. "You can think of our proposed scale as a way to quantify the hazard," he says. The scale ranges from 1 to 4, and would measure the potential hazard from fires and hot embers in an area. Maranghides says building codes have been developed to deal with earthquakes and even hurricanes, but there's a big blind spot when it comes to understanding wildfires. He says the scale, however, is not an attempt to restrict where people can build. "All we're saying is, 'At this point in space, this is the fire and ember exposure you can expect,' " he says. "So if you want to build there and you want your home to survive, the building materials and assemblies have to be able to withstand that exposure." If the history of structural fires is any guide, changing the approach to wildland threats won't take just years, but decades. In the meantime, the U.S. will almost certainly see more devastating fires.